This year (2008) I scheduled a "cold-weather" open house with a Christmas theme, my first ever. This is fourth in a series of notes on our progress. Part 3 includes some setup, some testing, and some rehabilitating of a downtown district that we wanted to include if possible. 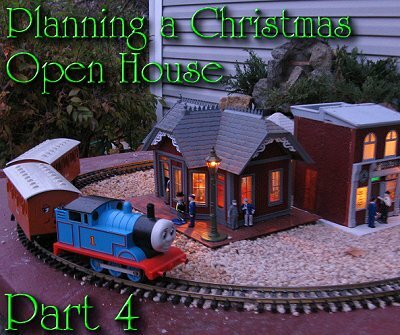 Part 4 covers the last two days, including the last-minute preparations before the open house. For all of the things to get done in the last 36 hours before the open house, I needed help. Fortunately, Shelia was willing to bake cupcakes and mix up lemonade and iced tea. And all three children (two high school teachers and a high school senior) were "home" for the weekend to help out. I took off work Friday to get the leaves cleaned off of the railroad and to get the other leaves in the yard raked away from the railroad. Initially my plan had been to do all of the raking Friday, but it kept raining, off and on. 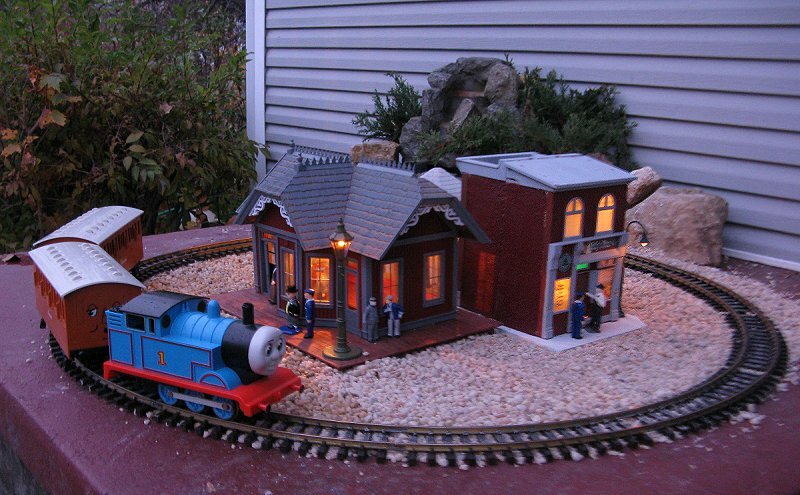 The "beginner pamphlet" that I take to train shows and clinics and give to clubs to hand out at their events: "What is a Garden Railroad?" A membership pamphlet that the Miami Valley Garden Railway Society gives out at train shows and other outreach activities. MVGRS is one of the most active clubs in the country; folks in the greater Dayton, Ohio area get a lot of encouragement and help from club meetings and members. Folks outside our area subscribe to support the hobby and to have access to the newsletters, which often contain some pretty good information. Click here for more information. A one-page handout we printed up just for this special occasion, "About Our Open House, Christmas Trains, and Garden Trains"
I had also planned to write a survey for each family with questions like "would you like to receive our free e-mail newsletter about garden trains" and "would you like someone from the Miami Valley Garden Railway society to contact you and answer any questions you have about garden railroading?" But I ran out of time. Instead, the morning of the open house, Shelia came up with a tablet and a pen for folks to sign in and leave their e-mail address if they wanted a newsletter (only a few did). Next time . . . Working on Leaves - Friday afternoon, when the rain picked up again, I made a run to town for some last-minute needs. By the time I got back the rain had almost stopped. My next challenge was the leaves on the railroad. Most of them had blown in this summer and fall, but, truth be told, some had been caught in various hidden crevices for over a year. Last week when I was thinking about this part of the process, I imagined that I would de-leaf the railroad the same way I usually de-weed it - working my way around with a big container and pulling things up by hand. When I looked at the railroad Friday afternoon, though, I realized it would take me more hours than I could spare for that particular task. So I did what Tim Taylor would have done and went for the nearest power tool - in this case a small Shop Vac I usually use in the attic, garage, and basement. The Shop Vac worked great, although I had to keep clearing jams in the hose and stopping to empty the container. It went far faster than picking them all up by hand would have, and it didn't disturb my groundcovers or miniature trees like using a hand rake would have done. In addition, the Shop Vac got leaves out of places I couldn't have done by hand, such as crevices between stacked stones, tight places under my trestle, etc. Of course I couldn't do this if there were little people all over the railroad, but they hadn't been set out yet. The main "gotcha" was that I had to be careful around my ballast and other loose gravel. I probably sucked up a pound altogether, but the trade-off of finishing in a couple of hours what would have taken me four or more by hand was worth it. The other "gotcha" was that the Shop Vac is top-heavy, and I had to be careful not to stretch the hose too tight - it could fall over on my buildings and cause damage that way. I bet someone makes a 12' or 15' hose for this thing so I could vacuum from a safe distance next time. That would make vacuuming out the minivan much easier, too. Saturday morning, the whole Race family got busy and stayed busy. Leaves, part 2 - Friday night we had a bit of a windstorm, so Saturday morning I had to revacuum part of the railroad before we could set out our little people. Our youngest two children - one a high school senior and the other a high school teacher in Indiana home for the weekend - gave me invaluable help by raking the part of the yard closest to the railroad. Snacks and Housework - In the meantime, my oldest daughter, also a high school teacher, helped Shelia by icing cupcakes and helping with last-minute housecleaning. Cosmetic Gravel - Finally, I used the rest of my "pea gravel" making Thomas' railroad look a little more established and pouring "roads" and "driveways" for the communities and houses on the "big railroad." Again, this is a VERY temporary solution, but it was effective for this project. 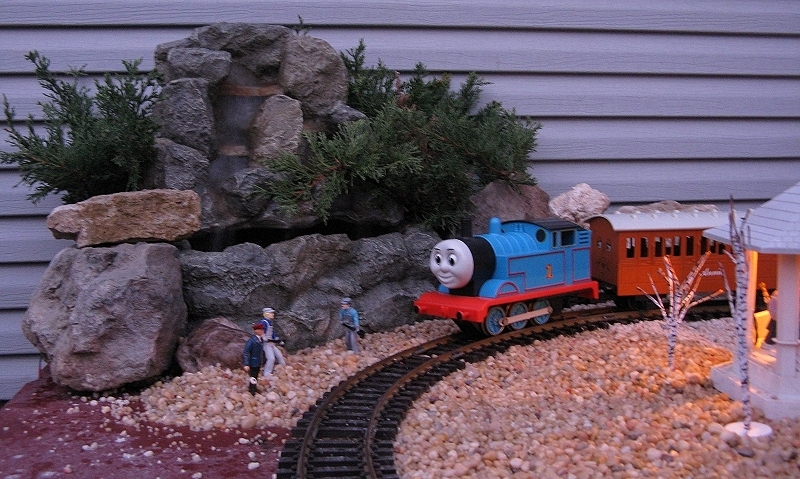 I also filled and started the waterfall fixture behind Thomas and plugged in the lighting circuit for Thomas' little village. Of course the lighting wasn't too obvious until later. . . .
People and Accessories - When the "big" leaf problems were dealt with "for now," Emily and Molly set out my little people and accessories, including many Christmas-themed accessories and figures that I don't use during the summer. Emily could remember certain LGB figures that weren't in the box with the others - so I dug them up, too. They were in the stuff I take around for clinics. My memory isn't that good - I'm not entirely sure I would have realized that those figures were "missing." 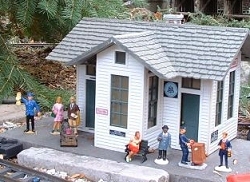 The photo to the right above was taken by Miami Valley Garden Railway Society webmaster Jerry Humston after the railroad was officially open, but I included this detail to show how diligent my helpers were setting out figures and accessories. To see the whole photo Jerry took, click here. Music - For music, Molly brought down her boom box and Shelia dug out several of our favorite Christmas CDs. I had hoped to put together something more "official," like an MP3 playlist and hidden speakers, but it did the job. Then Kristen and Molly made and put "parking" signs out on the mailbox post - pointing to the factory parking lot across the street, which is unused on Saturdays. I put out the "Open Layout" sign that the NMRA had given me, and started setting up and running the trains. If I had REALLy had my act together the trains would have been running before the sign went up, but we were cutting it too close and I didn't want anyone circling the block looking for our house (we have LONG blocks). 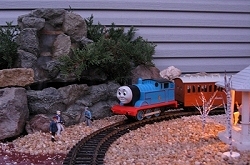 Thomas Rides Again - I started with Thomas, since he was easy to set up. Because it was sprinkling a bit, I started out with a .6 amp power supply that is weather resistant and runs small Bachmann and AristoCraft locomotives just fine. But Lionel Large Scale engines draw more wattage than you'd think, and Thomas seemed to be groaning his way around the track. So when the weather cleared up, I replaced that power supply with a 1.5-amp MRC supply built for HO (and therefore prone to rust if it gets damp). From that point on, Thomas was as happy as a clam (if clams are happy, that is). However, Annie - one of the coaches - wasn't altogether happy. She kept bumping up on a particular curve, although she never derailed. At first I thought some of the gravel was hitting her flanges. So I pulled out everything that protruded above the ties in that section. Finally I figured that that piece of track may be out of gauge, or else one of Annie's wheelsets or both. So fixing that problem might be more trouble than it was worth just then. I let her bump around for the next six hours. Note: The Thomas RR photos above were taken about twilight, as visitors were thinning out. Unfortunately, we were too busy to take photos of the other trains running, once folks started showing up. Fortunately several visitors took photos, so we'll keep plugging them in as they become available. Thanks to Jerry Humston for the two we've been able to insert so far. Engines on the Mainline A week or so earlier, I had tested my Aristo Mikado, Pacific, 0-4-0T, heavyweight coaches, and Sierra coaches on my railroad. I had determined that I could run my Mikado, but not the Pacific or heavyweights. Still the forces of nature (and my Shop Vac) may have releveled the track since then, so I planned to start out with smaller trains to test the trackage and work my way up. I started out with my Christmas-colored 0-4-0T, powered by an Aristo 5-amp power supply and separate 5401 controller. The 0-4-0T made a funny clicking sound, but ran smoothly all the way around my upper track. To get something running on the lower track, I set out a Bachmann Christmas trolley, driven by a Bachmann Large Scale power supply that had come with one of my Big Hauler sets. My plan was to transfer the Christmas 0-4-0T down to the lower track, once I was sure the bigger trains were running safely on the upper track. The Bachmann trolley seemed very happy and pretty much "in place" with the Western-style buildings in that part of the railroad (although Santa kept pitching forward with both hands over the rail as though he was seasick). 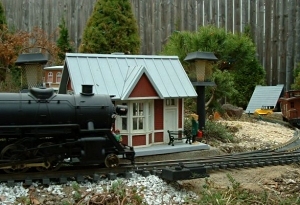 I attached one of the unlit Christmas Sierra coaches to the 0-4-0T. It went fairly smoothly around the railroad, although it did rock like a tinplate (toy) coach on an old-fashioned Standard Gauge train. AristoCraft fans know that that's normal for those, unless the track is perfect. So so far, so good. When the coach had ALMOST completed its circle, it derailed violently, losing one of its sets of steps. I hypothesized that it had snagged on a Christmas light strand that went under the track at that point. So I re-worked that so that the wire and lights lay closer to the ground. The next time around, it just derailed, more like it had flown off the track from centrifugal force than anything else (the unlit version of this car is very lightweight). I figured that the track was too uneven on that part of the curve and added a bunch of ballast, forcing the track to bank inward slightly at that part of the curve. The car still derailed, but less violently this time. I hypothesized that a heavier car might handle that curve better, so I got out the one with lights, interiors, and metal wheels. While I was getting more cars out, my kids put it on AFTER the car that was derailing and, surprisingly, it helped the middle car stay on the track. Then my friend Denny Lamusga (a longtime member of the Miami Valley Garden Railway Society) arrived. Denny took a look at my Pacific for me and came to the same conclusion I had - it needed internal repair of some sort. Time for a return trip to Aristo. It's probably 20 years old, and still in great shape otherwise, so I'm not complaining, you understand. When I made a brief trip inside for some reason, I brought out the literature and set it out on a "bistro" table on our back porch. By now people I didn't know were coming into the back yard, so I hit the play button on Molly's boom box, and the open house had "officially" started. 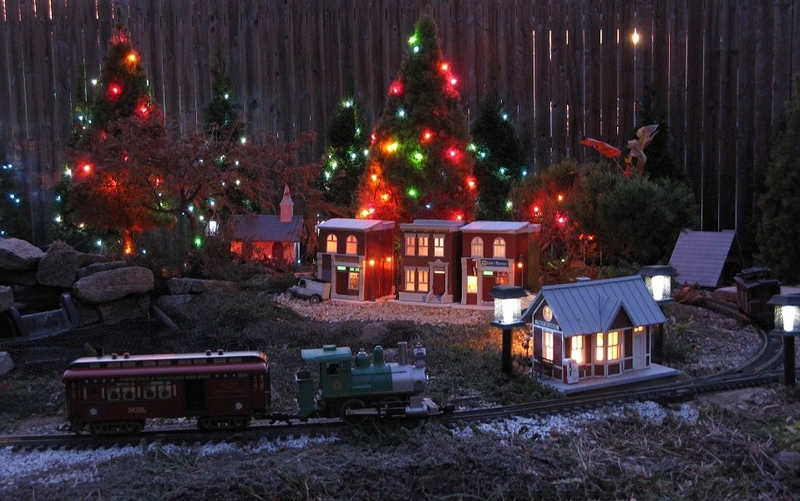 By the time people started showing up, we were still getting trains on the track, but our earliest visitors spread out enough that we had time to keep things moving forward, so that most people saw working trains and lights from the moment they showed up. Note: We'll put the "results" of the open house in our next blog-like article. You may feel I've put too much pickayune detail in these articles, but I just want to provide a realistic and encouraging picture of what it takes to put something like this together, as well as how much fun it is when you're done. Even closer to our hearts is the hope that this account helps you get ready for a Christmas season that encourages and restores you and those around you. 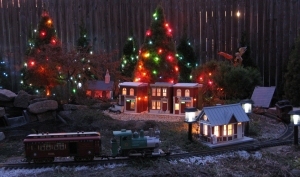 When I got my first strand of low-voltage garden lighting installed and my buildings all lit up at once, it was like having a "Christmas Village" bigger than my house. Since then, I've been thinking it would be nice if our whole railroad was a sort of 60'x15' Christmas card for all who could visit or read about it. So, if you're wondering what that photo of the Mikado dragging three mismatched coaches along the fence-row "means," it means "Merry Christmas and Best Wishes for the Coming Year." To go to Part 5, click here.